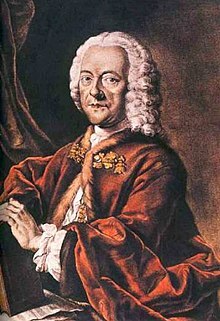 Georg Philipp Telemann (March 14, 1681  in Magdeburg - June 25, 1767 in Hamburg) was a German baroque composer. He wrote over 601 pieces of music, many of which were published. As publishing cost much money at that time, this was quite unusual. He mostly taught himself musically and knew how to play 10 instruments. During his life people thought he was one of the greatest composers. He also wrote lots of church music, most of which is not common today. This page was last changed on 13 October 2017, at 16:26.